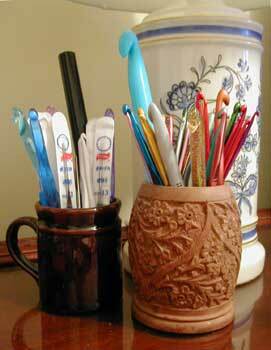 Dawn asks, “What holds your hooks?” A carved-wood thrift store find and a small, brown coffee mug from my childhood. Edited to add: The mug was given to me by the woman to taught me to crochet. For travel, I use either an old, much-loved pencil case or the Pop Top from my secret pal. I see you’re a two cup kinda gal….Love the wooden one (and I noticed the sparkly hook, front and center :)). My hooks are in a large round tin with classical scenes in blue and cream to simulate Wedgwood (it wasn’t successful). When I first started dating my bf he said, “Hey, the old lady who lived here before me left a bunch of craft stuff, you want it?” Well, the tin was FULL of crochet hooks, hence why he is still my bf. haha! Ooh I love the cup on the right. beautiful! I keep my hooks in a hard pencil box thingy… along with scissors…and there’s a perfect little section on the top for things like a tape measure and yarn needles and such… it works nicely, but my Q hook won’t fit! PS I know you used to link to my site (I’m not sure if you still do), but I wanted to let you know about the new URL so you could update the link! It’s http://www.hookmeupcrochet.com ! How exciting is THAT? What holds my hooks? An oval hinged eyeglasses case cushioned with pink felt “pillows”. I stick my regular needles in the felt, and the crochet hooks are just on the bottom of the case. I have Susan Bates Silvalume and Crystalites sets, and I just keep them in the case they came in. Perfect for travel.